~ Discussion of YA Lit, especially dystopian, sci/fi, and fantasy. Fragile Destiny (2014) is the third book in the Aether Chronicles by Suzanne Lazear. Ever the Steampunk fan, I always gravitate to these novels. I thought this book was going to conclude this series, but the ending makes that impossible. There will be at least one more in the series. In book 3, Noli and V are together, and in true Noli fashion, she rashly makes a decision that changes their lives forever! I don’t want to give it away, so I’ll just say…Noli and V’s relationship is taken to a new level, Elise becomes a prominent character, Kevign Silver returns to the Dark Court which becomes a surprising ally to the Earth Court, and an absentee character makes a grand appearance! If you enjoy Steampunk, then I recommend this series. It was so great to be back in the world of Divergent prior to the breakup of the factions, and of course, when Tris was still alive! Until Allegiant, Four was one of my favorite characters. Unfortunately in Allegiant he became weak and whiny, completely uncharacteristic of him. MANY things disturbed me about that book, BUT Four, A Divergent Collection, is back up to par with Divergent. For fans of Veronica Roth’s world, you don’t want to miss this collection of novellas from Four’s point of view! Endgame The Calling (October 2014) by James Frey and Nils Johnson-Shelton is the first in this new series. Before I bought the book, I looked up the reviews and it was compared to The Hunger Games mostly and even A Tale of Two Cities. A combination of Dickens and dystopian really peeked my interest, and I am glad I took the chance. It is a GREAT book! Although some reviewers said this book’s plotline is straight from The Hunger Games, I completely disagree. Sure, there’s the children killing children part, but the story is much more than that. My comparison would be a mixture of The Amazing Race, The Hunger Games, A Tale of Two Cities (I love that analogy), with some alien undertones in a pre-apocalyptic world. The “alien” founders (gods) of earth are disgusted with civilization’s treatment of the gift bestowed upon them and therefore have signaled the Endgame to begin. Twelve teens from around the world have been highly trained for just such a moment in case the time came during their lifetime. The players will fight each other to be the winners of Endgame so that their society will be the one to remain and rebuild earth – all other 11 civilizations will perish. There is action, adventure, surprises, romance, and these authors definitely do not mind killing off their twelve “main characters.” I know who I want to win! I’m also curious to know if the players will find a way to out maneuver the immortals (gods) and find a way to save earth without the destruction of humanity. Due to some language and mature scenes, I would recommend this book to high school and up. The video is simply for Steampunk fans and is based on the Finishing School series, but is not specifically from Waistcoats & Weaponry. This book begins with Sophronia and her friends in finishing school, continuing their espionage training. Of course Sophronia excels. 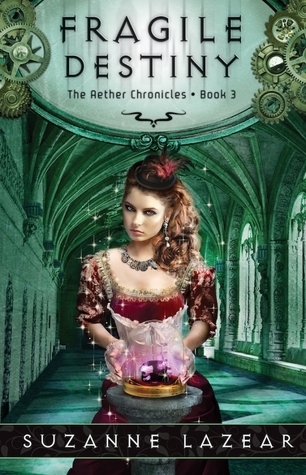 In this Harry Potter meets Steampunk series, there is always an adventure that only our heroine is capable of solving. Sophronia and a few of her friends attend her brother’s engagement ball where they witness the mechanicals go crazy. Sophronia (and gang) fly away in an airship and then steal a train with the hopes of solving the mechanical mystery as well as delivering Sidghead to Scotland to deal with a family werewolf issue. Sophronia is caught in a love triangle between the handsome yet spoiled Lord Mercy and the sootie, Soap. It’s a lot of fun! This series is recommended for fans of Steampunk adventure and is appropriate for upper middle school and up. In book one, everyone thought that the world had been invaded by aliens — little green men killing (and eating) the few survivors on earth. Now Amy knows the truth…the “aliens” are really humans who have been infected with a bacteria that changes them into monsters. The bacteria, she learns, was created by her own mother! In book one, Amy is rescued by some friends in New Hope and released back into the Florae infested world. After learning that Baby was captured in New Hope and is being tested and tortured for a cure, Amy seeks help in a former prison that is “protection” against the Floraes. Fortunately Amy meets Jacks who helps her survive the grim environment mostly filled with former prisoners, and she is able to return to New Hope where she plans to rescue Baby and hopefully find a vaccine. I thoroughly enjoyed these books. They are exciting and fast-paced — great for fans of zombie apocalypse novels. Recommended for 8th grade and up. Mortal Heart is the third book in the His Fair Assassin trilogy. [Grave Mercy and Dark Triumph are books one and two.] I really enjoyed Grave Mercy, and Dark Triumph was simply okay, BUT neither of them hold a candle to Mortal Heart, the story of Annith! I could barely put this book down, and when I was forced to, it was all I could think about! Annith was the novitiate waiting at the convent as she watched her friends Ismae and Sybella sent out to do Mortain’s (Death) work. Annith mastered every assassin’s tool and was still not chosen for an assignment until one day the Abbess selects her to be the next Seeress — a job that would confine Annith to a room of isolation never to leave the convent. Annith does not feel suited to this position and is insulted that her superior assassin skills will not be used as a Handmaiden of Death. In order to find answers, she runs away from the convent only to immediately encounter Mortain’s Hellequin army and fall under the protection of the head Hellequin, Balthazaar. Once Annith reaches the palace, she is able to serve the Duchess as she has long desired. The Duchess must make some difficult decisions to save her beloved country, but never fear…true love prevails! This fantasy assassin series is highly recommended for 9th grade and up. Other books that you many enjoy in this genre: Rift by Andrea Cremer, The Throne of Glass by Sarah Maas, Graceling by Kristin Cashore, The Girl of Fire and Thorns by Rae Carson, Shadow and Bone by Leigh Bardugo, and The Young Elites by Marie Lu. Michael Vey Hunt for Jade Dragon is book 4 in this exciting series. In this Michael Vey adventure, the Electroclan is prepped to rescue Jade Dragon, a young Chinese girl who is autistic, deaf, and can not speak. However, she is brilliant and knows the formula to create electric children — exactly what Hatch and the Elgen have been seeking. The Elgen kidnapped Jade and are holding her captive in Taiwan; the Electroclan work to create a plan to rescue the child from a heavily secured facility. Like the other books in this series, the problem is resolved in the way the reader would like, BUT there is always a cliffhanger that keeps us anxiously awaiting the next book. This series is great, especially for middle school boys, but is certainly an enjoyable read for all. Cassie, Ben, and Zombie are rescued from the explosion by Ringer, but what about Evan – Cassie’s “alien” boyfriend who helped save her brother? In order to save Teacup, Ringer allows them to be captured by Vosch who then experiments on Ringer, testing the limits of his “alien” technology. Ringer plays a large role in this novel. Like The 5th Wave, The Infinite Sea is filled with exciting twists and turns. I highly recommend this series. If you like book 1 and 2 then you must read book 3…I just did not like it as well as the others. This series is recommended for high school and up due to extreme language (mostly from Vida). Never Fade (2013) is book 2 in The Darkest Minds trilogy, and it is an exciting continuation of Ruby’s story in this dystopian adventure with a dash of romance. Warning! Spoiler alert for The Darkest Minds…Ruby has erased Liam’s memories of her to protect him from the Children’s League and give him an opportunity to reunite with his parents without worrying about her…or so she thinks. With her power to read people’s minds, she becomes one of the League’s greatest weapons for interrogation and operations. Liam’s older brother, Cole, is rescued by the League, and then sends Ruby on a private mission to locate Liam and retrieve a flash drive that was sewn into a coat he is wearing. From this op, old friends are reunited, and new alliances are formed. Also, previous villains resurface to aid in this novel’s nail-biting suspense. The end definitely leaves the reader ready to pick up book three, In the Afterlight (2014).